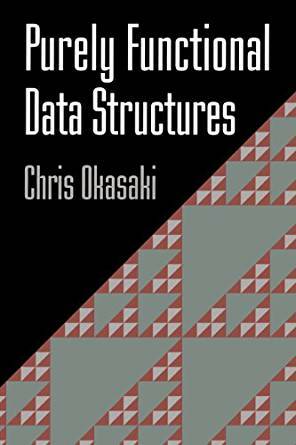 In this chapter Okasaki works around the problem of doing amortized analysis with persistent data structures because the amortized analysis assumes in place modification while for persistent data structures (partial) copies are made. The intuition is that lazy evaluation, which comes with memoization and avoids recomputation, solves this problem. He adapts the Banker’s and Physicists’s methods to work with lazy evaluated operations and applies them to a few structures including Binomial Heaps, Queues and Lazy Pairing Heaps. In this post we’ll only cover the examples of the Queues using both methods. We’ll first introduce some concepts and terminology, then we’ll present a queue implementation using lazy evaluation that allows us analyzing it under persistence. Following that we’ll explain the Banker’s and Physicist’s methods and prove that the implementation for push/pop has an efficient amortized cost. An execution trace is a DAG where nodes represent the operations (e.g. updates to a data structure) and an edge from nodes to indicates that the operation corresponding to uses the output of the one corresponding to . The logical history of an operation v is the set of all operations it depends on (directly or indirectly, and including itself). Equivalently, in terms of the DAG, it’s the set of nodes that have a directed path to v.
A logical future of an operation v is any directed path from v to a terminal node. We need to introduce a few more concepts and terminology. Note: we’ll use suspension and lazy operation interchangeably, which can be evaluated or forced. The unshared cost of an operation is the time it would take to execute it if it had already been performed and memoized before, so if the operation involves any expression that is lazy, that expression would be O(1). The shared cost of an operation is the time it would take it to execute (force) all the suspensions created (but not evaluated) by the operation. The complete cost is the sum of the shared and unshared costs. Alternatively, the complete cost of an operation is the time it would take to execute the operation if lazy evaluation was replaced by strict. To see why, first we note that the unshared costs have to be paid regardless of laziness. Since we’re assuming no laziness, the operation has to pay the cost associated with the suspension it creates, which corresponds to the shared costs. Note that under this assumption we wouldn’t need to account for the cost of forcing suspensions created by previous operations because in theory they have already been evaluated. When talking about a sequence of operations, we can break down the shared costs into two types: realized and unrealized costs. The realized costs are the shared costs from suspensions were actually forced by some operation in the sequence. Example: say that operations A and B are in the sequence and A creates a suspension, and then B forces it. The cost for B to force it is included in the realized cost. The unrealized costs are the shared costs for suspensions that were created but never evaluated within the sequence. The total actual cost of a sequence of operations is the sum of the realized costs and the unshared costs. Throughout a set of operations, we keep track of the accumulated debt, which starts at 0 at the beginning of the sequence. Whenever an operation is performed, we add its shared cost to it. For each operation, we can decide how much of this debt we want to pay. When the debt of a suspension is paid off, we can force it. The amortized cost of an operation is its unshared cost plus the amount of debt it paid (note that it does not include the realized cost). Note that as long as we always pay the cost of a suspension before it’s forced, the amortized cost will be an upper bound on the actual cost. This framework simplifies the analysis for the case when a suspension is used more than once by assuming that its debt was paid off within the logical history of when it was forced, so we can always analyze a sequence of operations and don’t worry about branching. This might cause the debt being paid multiple times, but it simplifies the analysis. The author uses the term discharge debit as synonym of pay off debt. I find the latter term easier to grasp, so I’ll stick with it throughout this post. Let’s introduce an example first and then proceed with the explanation of the Physicist’s method and the corresponding analysis of the example. To allow efficient operations on a queue in the presence of persistence, we can make some of the operations lazy. Recall in a previous post we defined a queue using two lists. To avoid immediate computation, a natural replacement for lists is using its lazy version, the stream data structure, which we also talked about in a previous post. For the list-based queue, the invariant was that if the front list is empty, then the rear list must be empty as well. For the stream queue, we have a tighter constraint: ‘front’ must be always greater or equal than ‘rear’. This constraint is necessary for the analysis. We store the lengths of the streams explicitly for efficiency. We’ll be using the Stream developed in the previous chapter, so we’ll refer to the module Stream2 to avoid ambiguity with the standard Stream module. The complete code for the stream queue is on Github. The idea of the Banker’s Method is basically define an invariant for the accumulated debt and a strategy for paying it off (that is, decide how much debt each operation pays off). Then we show that whenever we need to force a suspension, the invariant guarantees that the accumulated debt has been paid off. One property of the Banker’s method is that it allows associating the debt to specific locations of the data structure. This is particularly interesting for streams, because it contains multiple (nested) suspensions, so we might force parts of this structure before we paid the debt associated with the entire structure. By inspection, we can see that the unshared cost of both push and pop are O(1). It’s obvious in the case of push, and in the case of pop, in theory check could take O(m) where m is the size of the queue, but since Stream2.concat() and Stream2.reverse() are both lazy, and hence memoized, they are not included in the unshared costs. To show that the amortized cost of both operations is O(1), we can show that paying off O(1) debt at each operation is enough to pay for the suspension before it is forced. For the queue, we also need to associate the debt with parts of the data structure, so that we could force the suspension of only some parts of it (for example, on the stream we can evaluate only the head, not necessarily the entire structure). This constraint allows us evaluating the head at any time, because , which means its debt has been paid off. The second term in min(), guarantees that if the entire stream can be evaluated, because for all . The author then proves that by paying off one debt in push() and two debt units in pop() is enough to keep the debt under the constraint. Because the Physicist’s method cannot assign costs to specific parts of the data structure, it doesn’t matter if the structure can be partially forced (like streams) or if it’s monolithic. With that in mind, we can come up with a simpler implementation of the queue by working with suspended lists instead of streams. Only the front list has to be suspended because the cost we want to avoid, the reversal of the back list and concatenation to the front list, happens on the front list. On the other hand, we don’t want to evaluate the front list when we perform a peek or pop, so we keep a evaluated version of the front list too. and that the evaluated version of the front list is never empty if the lazy version still has some elements. The complete code for the suspended queue is on Github. Where w is the forcedFront, f is lazyFront and r is rear. We now claim that the amortized cost of push is at most 2. If we push and element that doesn’t cause a rotation (i.e. doesn’t violate ), then increases by 1, and the potential decreases by 1. No shared is incurred and the unshared cost, inserting an element at the beginning of rear is 1, hence the amortized cost for this case is 1 – (-1) = 2. If it does cause a rotation, then it must be that after the insertion and . After the rotation we have and , but w hasn’t changed and cannot be larger than the original , so the potential function is at most . The reversal of costs and concatenating to a list of size costs (discussed previously), plus the cost of initially appending an element to read, so the unshared cost is . No suspensions were created, so the amortized cost is given by . Our next claim is that the amortized cost of pop is at most 4. Again, if pop doesn’t cause a rotation, decreases by 1, so the potential is reduced by 2. The unshared cost is 1, removing an element from , and the shared cost, 1 comes from the suspension that lazily removes the head of lazyFront. The amortized cost is 2 – (-2) = 4. Note that if , we’ll evaluate , but the ideas is that it has been paid off already. If the pop operation causes a rotation, then the analysis is similar to the push case, except that the complete cost is must account for the shared cost of lazily reming the head of lazyFront, so it’s , for an amortized cost of 3. Note that when the suspensions are evaluated, the potential is 0, either when or . In this post we covered a simple data structure, the queue, and modified it to be lazy evaluated and can show, with theory, that it allows for efficient amortized costs. The math for proving the costs is not complicated. The hardest part for me to grasp is to get the intuition of how the analysis works. The analogy with debt is very useful. Meta: Since wordpress code plugin doesn’t support syntax highlighting for OCaml, I’m experimenting with the Gist plugin. Other advantages is that Gists allow comments and has version control!